We do not generally deal with individual consumer complaints or enquiries about water companies. There are a small number of complaints we do deal with. 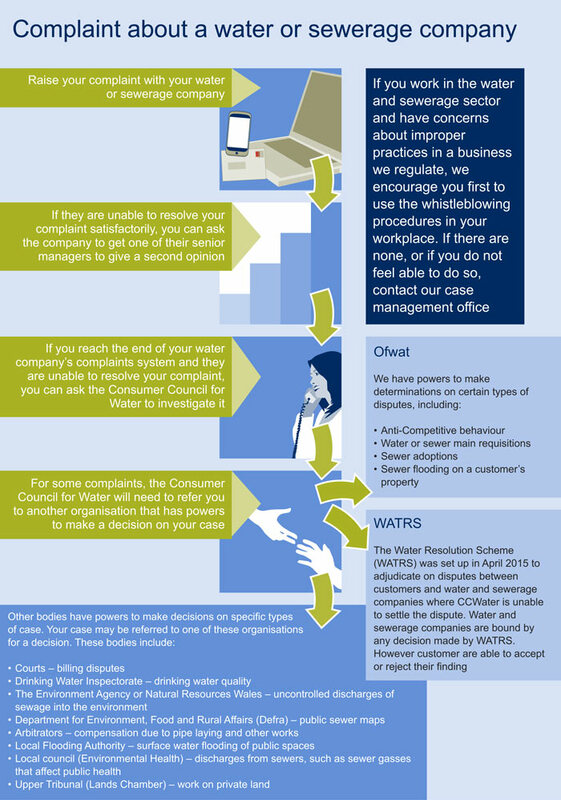 The diagram below explains what you should do if you have a complaint about your water company. We can also be reached on 0121 644 7500. We will always ask you to put your complaint in writing, unless there are exceptional circumstances. If you are submitting the complaint on behalf of someone else, you will need to provide us with signed authorisation of their consent. Further information on our timeframes for handling complaints. The flowchart below sets out the procedure that we will generally follow when dealing with disputes.